Alzheimer's disease is a progressive degenerative disorder of the cerebral cortex that accounts for more than half of all cases of dementia. An estimated 5% of people older than age 65 have a severe form of this disease, and 12% suffer from mild to moderate dementia. Alzheimer's disease is a slowly progressive disease of the brain that is characterized by impairment of memory and eventually by disturbances in reasoning, planning, language, and perception. Many scientists believe that Alzheimer's disease results from an increase in the production or accumulation of a specific protein (beta-amyloid protein) in the brain that leads to nerve cell death. The cause of Alzheimer's disease is unknown, The amyloid cascade hypothesis is the most widely discussed and researched hypothesis about the cause of Alzheimer's disease. The strongest data supporting the amyloid cascade hypothesis comes from the study of early-onset inherited (genetic) Alzheimer's disease. 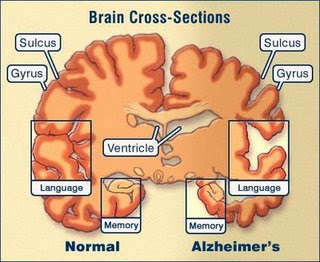 Mutations associated with Alzheimer's disease have been found in about half of the patients with early-onset disease. In all of these patients, the mutation leads to excess production in the brain of a specific form of a small protein fragment called ABeta (Aβ). Viral risk factors for Alzheimer’s disease such as slow-growing central nervous system viruses. Patient history shows very small changes, such as forgetfulness and subtle memory loss without loss of social skills and behavior patterns. Over time the patient began experiencing recent memory loss and had difficulty learning and remembering..
General deterioration in personal hygiene and appearance and an inability to concentrate. Progressive difficulty in communicating; and a severe deterioration of memory, language, and motor function that in the more severe cases finally results in coordination loss and an inability to speak or write. Negative personality changes e.g. Irritability, depression, paranoia, hostility, and combativeness, nocturnal awakening, disorientation. Cerebral blood flow studies may detect abnormalities in blood flow to the brain. No definitive cure or treatment for Alzheimer's disease. Only focuses on attempting to slow progression of the Alzheimer’s disease, managing behavioral problems, implementing modifications of the home environment, and family support. Alzheimer's Disease, An Issue of Nursing Clinics! Cognitive Neuropsychology of Alzheimer's Disease! Pharmacological Treatment of Alzheimers Disease!